Many people love popcorn, and Americans consume over 17 billion quarts of popped popcorn every year. Since the late 19th century, popcorn has evolved from the small bags sold by street vendors to large containers of fluffy kernels available in movie theaters. Despite the many changes in its preparation through history, popcorn does contain valuable nutrients. Popped corn is created by heating dry corn kernels until they burst, revealing the inner part of the kernel. The starchy center becomes light and fluffy. 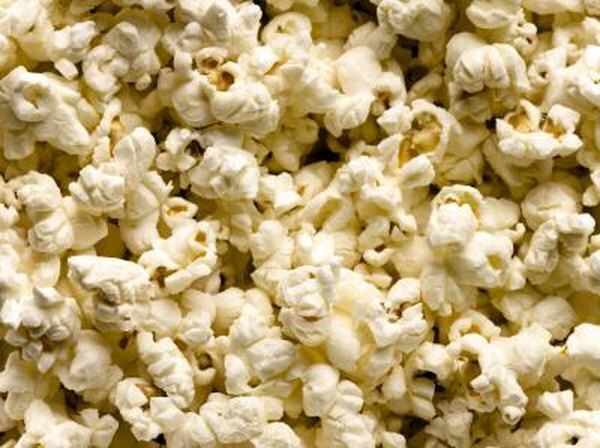 You can enjoy popcorn plain, which keeps down the calorie count, but many enjoy adding flavorings such as butter or salt. One cup of air-popped popcorn contains only 31 calories, while the same amount of oil-popped popcorn contains 55 calories. Plain popcorn is naturally low in fat and sodium, but does contain some other nutrients, including small amounts of protein, potassium, phosphorus and zinc. One cup of air popped popcorn contains over 6g of carbohydrates. According to the Popcorn Board, popcorn is a type of whole grain. If you are trying to reduce your intake of refined grains and switch to whole grains, popcorn can be counted as a whole grain. Popcorn contains complex carbohydrates, which make you feel full longer. Fiber is a type of carbohydrate that is not digested by the body. Fiber does not add calories, but is important for digestion and helps regulate bowel function and reduce constipation. Some types of fiber work to lower your cholesterol, which reduces your risk of heart disease. According to Fit Day, a diet and weight loss journal, one cup of air popped popcorn contains approximately 1.2 grams of fiber, which is about 5 percent of the recommended daily allowance. Some varieties of popcorn have more carbohydrates, because they contain added sugar. For example, one ounce of caramel popcorn has 22.5 grams of carbohydrates, which is about 7 percent of the recommended daily value. Over 15 grams of those carbohydrates come from sugars. If you are watching your carbohydrate intake, avoid popcorn with lots of added sugar. Popcorn is not only available in basic air-popped or oil-popped varieties. With the wide range of flavored popcorns and the ease of microwave popcorn, you have a lot to choose from. Although some popcorn flavorings may add extra carbohydrates from sugar, most microwave popcorn varieties are similar in carbohydrate count. Read the label before buying popcorn, especially if you are watching your fat, sodium or carbohydrate intake. Many types of microwave popcorn contain high levels of sodium and fat that have been added for flavor.